The High Court in Livingstone has stopped Chilufya Tayali from defaming Hakainde Hichilema. Chilufya Tayali is receiving funding from state house to insult and defame the UPND leader on the Internet, TV and radio. Despite being sued, Tayali has vowed to continue with his malice as long as long as state house continues releasing funds. 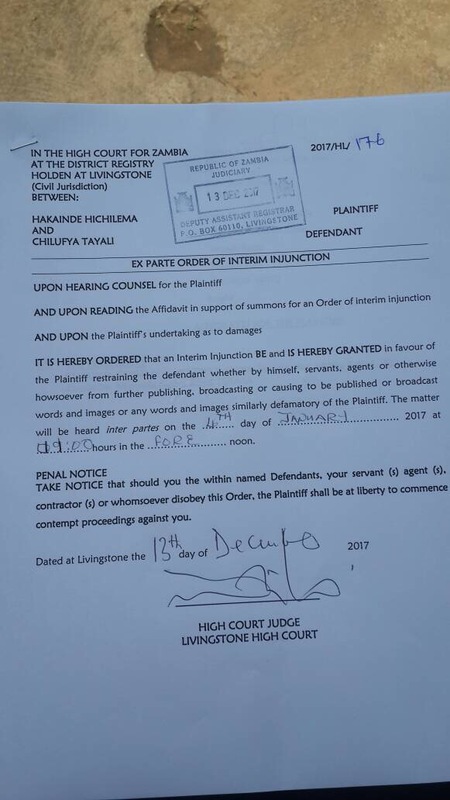 But HH ‘s lawyers have now obtained an interim injunction that stops Tayali from defaming him. Tayali and HH’s lawyers will meet in court in Livingston on 4 January 2018.